We wrapped up FinovateFall in New York City about a week ago. Over the course of two days, 64 companies give seven-minute demos to an audience of around 1,100. We’ve summarized the information and presented in our latest Finovate Report, Fall Edition. This post-show wrap-up is designed to help those that weren’t there get a better understanding of the major themes. And for those that were in attendance, it’s a box score to compare with your own notes and impressions. ZipZap to power global cash payments for omba. Forbes mentions Credit Sesame, Tuition.io, PayTap, Digital Mailer as 4 tools to help you manage your money. Capital Access Network closes $295 mil credit that to serve the small business community. PYMNTS chats with Kabbage’s co-founder & chief operating officer, Kathryn Petralia. GambleID taps Locaid for geolocation services. PC World features Yodlee, ShopKeep POS, Bolstr, PaySimple, CommunityLend, & Billhighway. CU Times reports Mortgagebot Launches First Credit Union on Integrated Platform. SafetyPay, in conjunction with the Bank of Montreal, the RBC, TD Bank & Scotia Bank, offers online payment service via Canadian Interac network. Fiserv selected as Affinity Provider in FPA Practitioner Resource Guide. CNet features Giftly’s iPhone app. Currensee delivers PAMM Replacement Solution for CTAs and Money Managers. Netbanker: BillGuard is first financial service to Integrate with the New iPhone Passbook Wallet. Compass Plus partners with WorldWide Financial Services. Our fifth annual FinovateFall in NYC concluded an hour ago. After seeing 64 demos over two packed days, the audience voted for their three favorites each day. The top eight overall were named Best of Show (see notes). 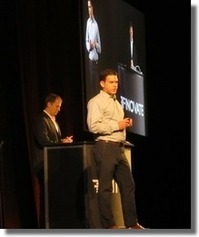 We’ll have videos of all 64 demos posted at Finovate.com as fast as possible (probably two to three weeks out). Thanks to everyone who presented, attended, tweeted, networked, blogged, tolerated the Internet hiccups and helped push fintech forward. You are the best! 2. Attendees were encouraged to note their favorites as the day went on and choose three favorites from just the demos of that day. Ballots were turned in at the end of the last demo session each day. 4. The eight companies appearing on the highest percentage of submitted ballots were named Best of Show. “The simplest way to make smarter business decisions, ShopKeep POS is the affordable and complete cloud-based point of sale platform for running a store from an iPad. Fox Business News interviews Personal Capital CEO, Bill Harris, on 401(k) fees. ShopKeep POS launches new iPhone app to give merchants better, faster access to real-time sales data. Come check out ShopKeep at FinovateFall next week. Forbes considers: Why Intuit Is More Innovative Than Your Company. TechCrunch reviews Giftly’s new app. FreeMonee wins Direct Marketing Association 2012 Innovation Award. Kiboo announces 3 key partnerships with First California Bank, FIS and MasterCard. We’ve selected over 60 leading innovators to take the stage for the sixth annual FinovateFall conference in New York on September 12 and 13. Don’t miss your chance to see the live demo from each company and meet the execs responsible. Get your FinovateFall ticket here. Socialite from Actiance allows financial advisors, agents and sales and marketing to engage with clients, build customer relationships, and create a personal brand – all while being compliant with FINRA and SEC regulations. At Finovate you will see for the first time the integration of Actiance’s Socialite platform with Salesforce enabling users to maximize the power of Salesforce, monetize their social involvement and increase revenue. Now users can Link Socialite contacts to Salesforce accounts and send Socialite activity to Salesforce when contacts provide feedback or respond to posted content. In addition, we will be showcasing our new Socialite Mobile application for the iPhone. Come meet Billhighway at the intersection of technology and philanthropy! It’s your chance to witness the debut of a faster, more compelling way to fundraise. Billhighway’s mobile application, unveiled for the first time at FinovateFall 2012, brings a mobile cashless approach for an easy, secure, fun way for folks to give in real time, and perhaps give more! The application is specifically developed for nonprofits to effectively increase funding from new sources. A great example of technology used for good, nonprofit organizations immediately collect and put to use mission-critical donor funds, the lifeblood of their efforts to do more good. BCSG will be launching an innovative and customizable cloud-based package at FinovateFall 2012, incorporating the most important tools a small business owner needs to manage and grow their business. For just $25 a month, users will get access to several market leading applications via one online platform using a single username and password. This unique package has been developed specifically to address the day to day challenges small businesses owners face and is supplied through financial institutions. CommunityLend’s product, Financeit, enables businesses to offer installment loans to their customers at the point of sale. Since launching in January of 2011, they have signed up over 1,200 merchant partners and processed over $130MM in loans. The key verticals are vehicle, home improvement, retail and health. CommunityLend has raised over $9MM in financing since launch and is now pursuing a U.S. expansion strategy. Lending capital comes from banks and other institutional investors. Can “The Cloud” be trusted to store important files? Are safe deposit boxes still practical in the age of electronic documents? Is there a way to ensure “Total Information Privacy” for the customer? My Virtual StrongBox is the online answer to safe deposit boxes. Customers store electronic copies of important documents in this easy-to-use filing system AND retain ownership of their documents. Files are managed by, and only visible to, the customer. Financial institutions using My Virtual StrongBox add one more sticky product to their list of benefits and keep customers around for years to come. Learn more at myvirtualstrongbox.com. Fiserv understands that convenience and supporting user preference are keys to increased adoption and usage of digital payments. Our innovation seamlessly blends a variety of information input modes in our mobile banking application, Mobiliti Enterprise. Using our applications, users can choose from traditional keypad and screen touch interaction, image capture and OCR, or voice-driven commands and inputs to make payments. And a key feature is that users can effortlessly switch modes at any time, whenever they want – even in the middle of a transaction. In a world optimized to get us to spend more at every turn, ImpulseSave has made saving your money just as easy and instantly gratifying as spending it. Our simple web and mobile tools incent consumers to turn every point of sale into a “Point of Saving”, as well as every point in between. ImpulseSavers are saving close to $4,000 per year on average. While others argue that greater discipline and better budgets are the answer, ImpulseSave represents the exact opposite approach. Instead of trying to change consumer behavior, encouraging more self-denial, we’ve actually transformed saving itself to leverage that very behavior, making saving as impulsive, fun, even addictive as is spending. Ready, Set, Locate! See how one easy-to-use API can locate any customer or cardholder mobile phone for authentication or mobile marketing. No apps to download, it works on feature phones, smart phones or on any carrier. Mobile phone network location can be a low cost, high quality, unspoofable authentication factor for mobile payment and credit card identity. See Locaid’s live location demo that can be easily integrated into any CRM system, mobile marketing, web services or anti-fraud applications. With a mobile device number and permission, you can locate 350 million devices via our location privacy platform. See how financial institutions can save millions by implementing BankFiling, a first-of-its kind innovation that delivers significant ROI yet requires limited investment. A whole new approach to commercial and business banking! Prepare yourself! The fear of not getting paid and concern over finding new clients is keeping small business owners up at night. PaySimple is launching a “get paid faster while you grow your business” addition to its PaySimple Pro receivables automation solution. The innovation automates pricing to ensure the small business is paid on time and also fosters social engagement as a natural extension of the payments process. Times are tough. The kids are in college. You’re caring for aging parents. You’re underemployed. You have bills. Bills that are due. But your family and friends want to help. Because that’s what family and friends do. If only there was a way for them to provide this financial help quickly. Conveniently. Securely. Online. Without the hassle of sending cash and checks, or the high cost of wire transfer services. Meet PayTap. Personal Capital is wealth management for the Internet Age. The company’s online platform combines digital technology with highly personalized service to provide a holistic view of your unique financial picture. The free online dashboard, iPad and iPhone apps present all of your financial data in one place, showing you exactly what you own and what you owe, in real time. 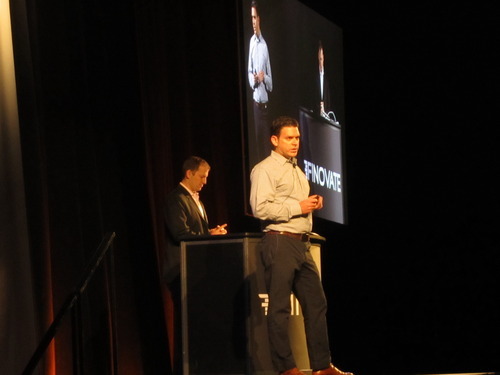 At Finovate Fall, Personal Capital will unveil new features that enable even greater transparency into your money for the long-term: your retirement. Do you know how much your 401(k) costs? Pindrop Security’s technology is being used by banks to identify fraud callers and to prevent fraud transactions. In the Fall of 2012, we’ll introduce our latest solution for financial institutions that rely on the phone for transactions. Join us for the debut at FinovateFall 2012! Prepaid Resources introduces BenefitsDirect ‘Direct Deposit Management’. Capture recurring Federal benefits, State benefits and Payroll deposits through your accountholder website, in-branch, at retail, by mobile app or via live agent. Track enrollment success and measure direct deposit activity to proactively personalize accountholder relationships. ShopKeep solves the last mile in local. It enables vertical partners from delivery, payments, loyalty, and deals to connect directly to SMBs. 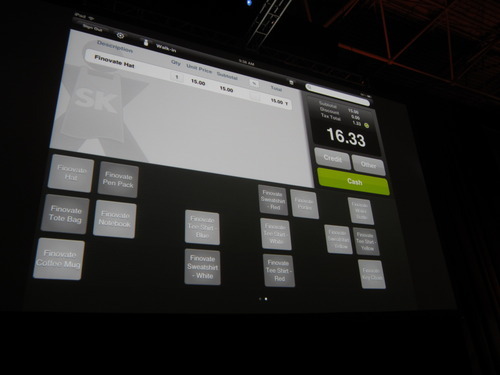 A revolutionary iPad based SaaS product, ShopKeep’s POS system makes traditional cash register products obsolete. For $2/day merchants receive a high end operating system and can manage their store even when they are not inside it. Made in NYC, ShopKeep now has over 2,500 customers. It provides merchants flexibility to choose their credit card processor and offers unheard of customer support and economics. ShopKeep POS is the simplest way for retailers to make smarter business decisions. Stockr is a finance portal for the social web. For most people, investing is more social than scientific, and investment ideas come from close friends, trusted advisors and various periodicals. Stockr embraces this social element of investing, creating powerful connections among those who have actionable information and those who are seeking it. While other portals compete on content, our view is that content becomes most relevant and actionable when it’s shared and discussed. Everyone has come to expect innovative, reliable and low cost local currency payment services, yet we continue to live with expensive and unreliable international payments. Over $37 trillion in foreign currency payments are sent or received each year. The international payment services offered by the major banks are far from satisfactory. The Currency Cloud evolves the international payments process – we make currencies simple. With Tuition.io, student loan borrowers can easily access all their loans in one visually appealing dashboard, use graphical visualization tools to compare them and get customized optimization plans that take advantage of little-known and hard-to-understand restructuring options. The mobile phone is fast becoming a dominant player in payments and banking worldwide. As electronic fraud will certainly be drawn to the new medium, so too must security be made usable, flexible and ultimately reliable. ValidSoft’s proprietary technology can secure all transaction channels, in real-time. All our solutions are telecommunications-based. At FinovateFall 2012 we will show you how our advanced mobile payments authentication platform, SMART, supports a mobile wallet product and demonstrate how scalable and flexible it can be. Inc. Mag features ReadyForZero & Tuition.io as tackling the student debt crisis. Check out Tuition.io at FinovateFall. Orlando Sentinel reports Kony Solutions is on cutting edge of app development. AOL Daily Finance features Kabbage. The Chicago Tribune reports Braintree to add 150 jobs. 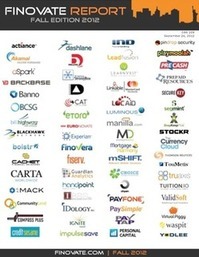 Check out Q2 funding for Finovate alumni: over $120 mil raised. ReadyForZero begins Smart Money Debate series. Netbanker reports: Bank Simple Innovations #1 & #2: Demo Mode After Login. MiiCard names RBS tech veteran Stephen Brannan chairman. BostInno features LearnVest. Come see LearnVest’s new fintech at FinovateFall in NYC next month. Beloit Daily News looks at how 2 local businesses are using ShopKeep POS.